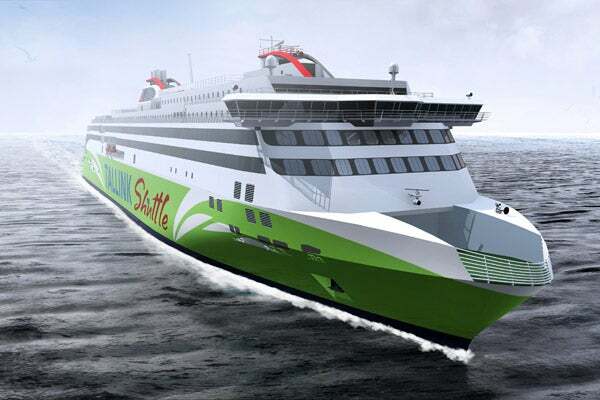 Tallink’s new LNG-fuelled ferry operates on the Tallinn-Helsinki route. Photo: courtesy of Meyer Turku. The vessel's innovative hull design is expected to minimise the flow-resistance and enable the ship to operate in icy waters. Photo: courtesy of Meyer Turku. The fast ferry is 212m-long and has a gross weight of 49,000t. Photo: courtesy of Meyer Turku. Meyer Turku shipyard started the construction of the LNG-powered vessel in August 2015. Photo: courtesy of Meyer Turku. Tallink’s new liquefied natural gas (LNG) fuelled fast ferry Megastar was constructed by Meyer Turku shipyard. The first piece of steel was cut for the vessel as part of a ceremony held in August 2015, while keel-laying began in February 2016. The ferry was delivered in early 2017. Fuelled primarily by LNG, the vessel complies with new, more stringent regulations for emission control areas (ECA), including the Baltic Sea. It operates on the Tallinn-Helsinki route under the Tallink Shuttle concept, the firm’s service concept for fast ferries. Named Megastar in January 2016, the ferry is classed by Bureau Veritas, whose subsidiary Tecnitas performed risk assessment studies for LNG bunker operations in Helsinki and Tallinn ports, as well as hazard identification (HAZID) studies for the LNG propulsion and storage on-board. The overall cost for the construction of the LNG-fuelled ferry was €230m ($260m). Nordea Bank Finland arranged a 12-year loan of €184m ($208m), which was 95% guaranteed by Finnish export credit agency Finnvera. Up to 20% of the total cost was paid during the construction period and the remaining was paid on delivery. The Megastar fast ferry is 212m-long and has a gross weight of 49,000t. It is capable of carrying 2,800 passengers and 300 crew members. The vessel integrates an innovative hull design, which minimises the flow resistance and enables the ship to operate in icy waters. The vessel has also been designed to provide efficient and fast cargo turnaround in ports. The vessel’s engine and propulsion machinery includes three 12-cylinder Wärtsilä 50DF and two six-cylinder Wärtsilä 50DF main engines, including two Wärtsilä fixed-pitch propellers and propeller shaft lines. The propulsion system provides the vessel a service speed of 27kt. ABB was contracted to supply the vessel’s electrical propulsion systems and an energy management solution. The delivery included synchronous propulsion motors, ACS600SD drives, medium-voltage generators, a main switchboard, propulsion transformers, thruster motors and ABB’s EMMA energy management system. Stena Superfast X, a new fast Ro-Pax ferry, was launched at Dublin Port, for service between Holyhead and Dublin, in March 2015. Consisting of two horizontal, vacuum-insulated 300m³ tanks, the vessel’s LNG fuel gas system was supplied by Linde. The contract also included the delivery of gas handling and control systems. Cargotec subsidiary MacGregor supplied the roll-on / roll-off (RoRo) equipment, including a bow door, bow and stern doors, front and rampway doors, hoistable and movable ramps, a lifting platform, stores hatches, doors for passengers and associated hydraulic power facilities. The engineering and design work for the vessel’s heating, ventilation and air-conditioning (HVAC) systems were performed by Sance in collaboration with Orsap. Becker Marine Systems has been contracted to supply two of its proprietary TLKSR twisted leading-edge rudders with bulbs for the twin-screw ferry, to enhance its manoeuvrability. Trelleborg Sealing Solutions is the sole manufacturer of Orkot® Marine Bearings. These are synthetic composite bearings used in shipbuilding for rudders and water lubricated stern tube bearings amongst many other applications. They are available through a global network of distributors supporting the shipbuilding and ship repair markets. Orkot® TLM Marine has been used in a large number of deck machinery bearing applications. Orkot® TLM Marine has been used in a number of stern tube bearing applications worldwide.